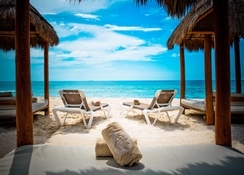 Secluded on a white-sand beach in Playa del Carmen, the 5-star Valentin Imperial Maya is a seafront oasis offering an idyllic adults-only getaway in the Mayan Riviera. The all-suite hotel offers spacious accommodation featuring all the necessary amenities needed for a unique stay. 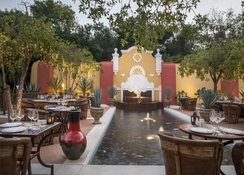 The hotel features seven exceptional restaurants with a unique offering – no reservation required! During the day, lounge by Valentin Imperial Maya's three swimming pools, head to the state-of-the-art spa, or indulge in unlimited gourmet dining at the hotel's variety of restaurants and bars, serving Italian, French, Asian, Japanese and Mexican fare – with fantastic views to match. This resort is set on one of the most delightful shorelines in the zone, there's a coral reef nearby and the inward bay is perfect for swimming and kayaking experiences - providing the ultimate "away-from-it-all" feel. 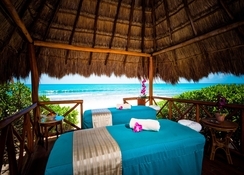 This extraordinary hideaway is situated inside Riviera Maya's most esteemed oceanfront at the core of the Riviera Maya. 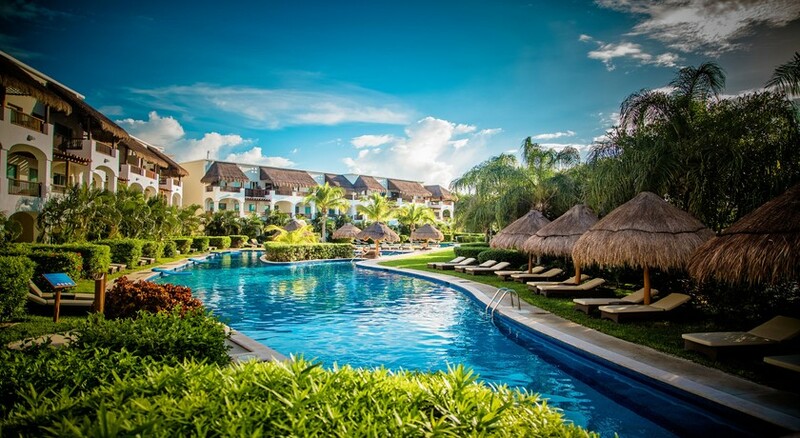 It is 25 minutes' drive from Playa del Carmen, only 32 minutes from Cancun International Airport and a short 3km from Cirque du Soleil restaurant. 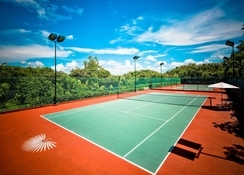 The resort includes free transport to Playa del Carmen during day time. It is 31km from the Xcaret Park (theme Park). Solace is fundamental to appreciate an extravagant get-away and the Hotel Valentin Imperial Riviera Maya is the ideal place for it. The extensive frontier style suites, with colour as a primary theme, have all that you need to appreciate a remarkable get-away with state-of-the-art facilities. The hotel likewise also has many specially adapted rooms for specially-abled individuals. 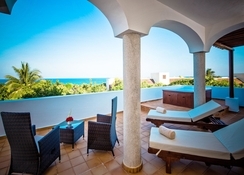 The hotel has 524 Junior Suites and 16 One-Bedroom Suites with views of the lush gardens, Caribbean Sea, lagoon or pool. Guests can choose between Deluxe Junior Suites, Silver Junior Suites, Golden Junior Suite, Golden Superior Junior Suite, Golden Swim-Up Junior Suites, Diamond Privilege Suite, Imperial Privilege Suite and Emerald Junior Suites. The hotel houses restaurants in the main building, by the beach and also conducts special “fiestas” which varies in location. Restaurants in the main building consist of Le Marché, which serves buffet breakfast: 7am – 11am buffet lunch: 12 noon – 4pm; à la carte lunch: 4pm – 6pm. The beach restaurant is Mary Tierra which serves fresh seafood. Bars at the hotel are Sunset beach bar, main Lobby bar “Don Miguel,” “Plaza España,” Sports & Music Bar, Cigar bar “Partagas” and a Martini bar. Enjoy a host of facilities at the hotel with something on offer for all adults. The hotel offers three swimming pools with the main pool having an area of 4,200 sq. meters, one meandering swim-up pool and one activities pool. 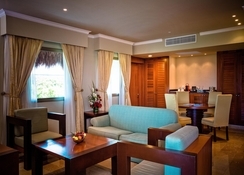 The hotel also conducts daily activities, daily evening shows and live evening entertainment.